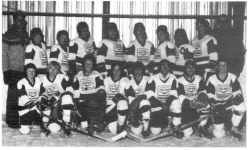 Provincial Champions 1975-1976, Erickson-Onanole Midget Minors, Winners of the C and D Divison. Front Row: R. Griffiths, G. Griffiths, v. Ullberg, D. Gusdal, B. Maxwell. Second Row: Ken Griffiths (coach), S. Shellborn, D. Yanchycki, L. Carlson, R. Wilson, R. Woloshen, J. Mcl.aughlin, G. Allan, K. Larsen, L. Woloshen, Lane Allan (manager). Coach Laurie Holt, Mark Andreychuk, Danny Mason, Clifton Eden, Graham Ledoux, Shawn Beatty, Brett Bachewich, Alan Gregorash, Coach Cliff Eden. Front Row: Wade Huntinghawk, Glen Skipper, Dwayne Brown, Jason Uhl, Michael Ball, Darren Yanchycki, Rodney Radcliffe. years of hockey was played in this open air rink. In 1952 a closed-in Memorial Rink was erected. 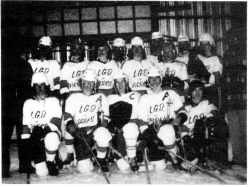 The teams grew in numbers, they played better hockey, competing in leagues right from the Pee-Wee level to the senior boys. Boys who showed potential were sent away to hockey school, bring home awards for most enthusiastic players to the most improved players. Provincial Championships were won. There were a few years that hockey was dampened by poor facilities, but in 1981 a new steel rink was erected and once again, the boys both big and small, old and young can play the Roaring game. Coach Bob Uhl, Derek Yakielashak, Rodney Robinson, Scott Moyer, Watson Huntinghawk, David Derkach, Darren Skog, Brent Wilson, James Brookman, Assistant Coach Don Steele. Front Row: Jeff Uhl, Blair Jacobson, Greg Griffiths, Brad Mason, Trent Mochnacz, Melvina Huntinghawk, Sanjay Khandelwai, Glen Steele. The "Erickson Swingers" Slow Pitch Ball Club was organized in the spring of 1978, joining the Rolling River, Qualifying age to play is thirty-five years and over. 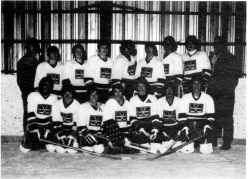 The League, made up of six teams, Erickson, Onanole, Clanwilliam, Minnedosa, Riverdale and Rapid City, Basswood and Hazelwood joined the league after a few seasons, bringing the total to eight teams. The rules differ from fastball in that a larger ball is used, slow pitch bats, all ten players bat each inning, no tagging or sliding, just to name a few. Games are played once a week from late May until early September. Several teams have hosted an annual Slow Pitch Tournament. For the past three seasons Erickson has also hosted a Slow Pitch weekend curling bonspiel in March. Most of the original team members are presently ac­ tive. Sweaters and Jackets were purchased, each person buying their own. Prize money won at tournaments has been donated to the New Erickson Skating Arena Memorial Fund and to the Local Fair Board. On December 15, 1970, John Gustafson attended council to inform them of the Torch to be lit by Prime Minister Trudeau in Ottawa and to be carried by Bombardier Skidoo from Ottawa to the Winter Games in Saskatoon and the torch would be carried to Erickson on February 7, 1971. Council agreed to assist as required on the stop over in Erickson. On February 7, the torch arrived and was carried by local snowmobilers from Erickson to Dauphin.